oh my CAT! How'd you guys score a seat at Times Square?!??!? MOMMY! We've decided we're sorely mistreated. Nellie, Kozmo, the Hairy Slobbery sisters Bob and Cinnamon and Mommy! Is that NYC in the background and are you two gonna take it on? Happy New Year, Katie! I look forward to lots of adventures from you (and Waffles Too) in 2013! Happy New Year to alla you! Hey, Waffles could stand in for Baby New Year! Happy New Year Katie, Waffles Too, & GloPeeps! God bless y'all in 2013. We look forward to your adventures. We really love your blog! That Glogirly is so creative and Gloman sure has contributed some awesome pictures. We wish all of you a very Happy New Year!! Happy New Year Katie & Waffles II! We've so enjoyed your blog this year & look forward to more dramatics in 2013! Cheers! We hope your year is happy & HEALTHY! For you and the hoomans! We Hope For Your Fulfillment, Contentment, Peace And A Brighter, Better New Year Than You've Ever Had Before! Happy New Year to all of you - we look forward to your daily updates every day. Love and purrs from Ingrid, Allegra and Ruby. Hi Glogirly, Katie, and WafflesII! Happy New Year Waffles Too too! Happy New Year Glogirly & Gloman! Thank you for sharing so much laughter with us here on the blog this year! 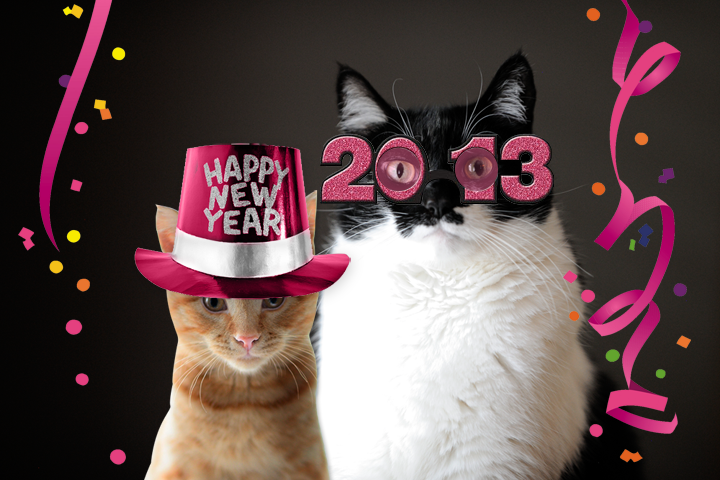 Katie, Waffles, and Glopeople, we hope you have a wonderful 2013. Happy New Year! We love you and wish you the HAPPIEST of New Years! Have fun in NYC! And don't try to whappy that ball! Happy New Year to all you guys even though W2 stoled my hat. I'll be around to pick it up and he better watch out cos it won't be pleasant if he resists. We're wishing you a healthy and happy new year! Happy New Year to both of you. May there be peace in the townhouse. Happy New Year! Can't wait to see what it has in store for you all. Happy New Year, Katie, Waffles Too, Glogirly and Gloman! Love to you all!! Happy New Year to you and yours!! Happy New Year dear friends. We love your bloggy - it's always interesting, extremely funny, and just good clean fun! Now we think Waggles is cute and funny too - well maybe not quite as cute and funny as Katie - she's hard to top afterall! Happy New Year Katie, Waffles Too, Glogirly and Gloman! We wish all of you a happy and peaceful year! 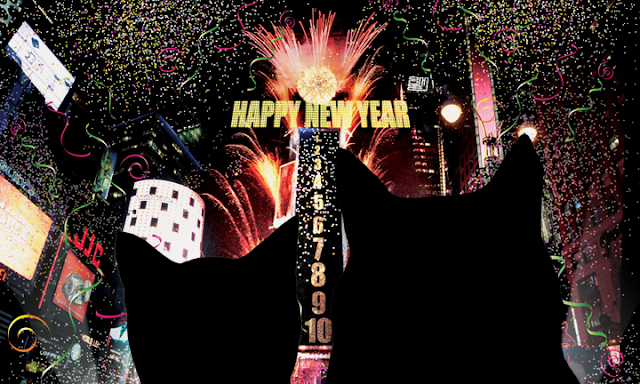 May 2013 be more exciting and fun !! Happy New Year to all of you from all of us in Ohio Here's to a safe and happy new year for everyone. We really enjoyed reading your blog! So thank you! You two are pretty brave to be calmly watching fireworks!